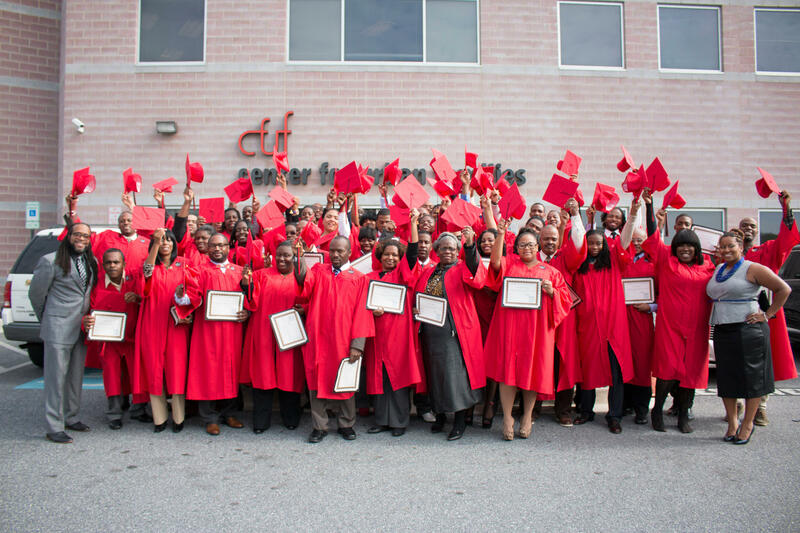 Graduates of a training program pose for a portrait after a completion ceremony at the Center for Urban Families. 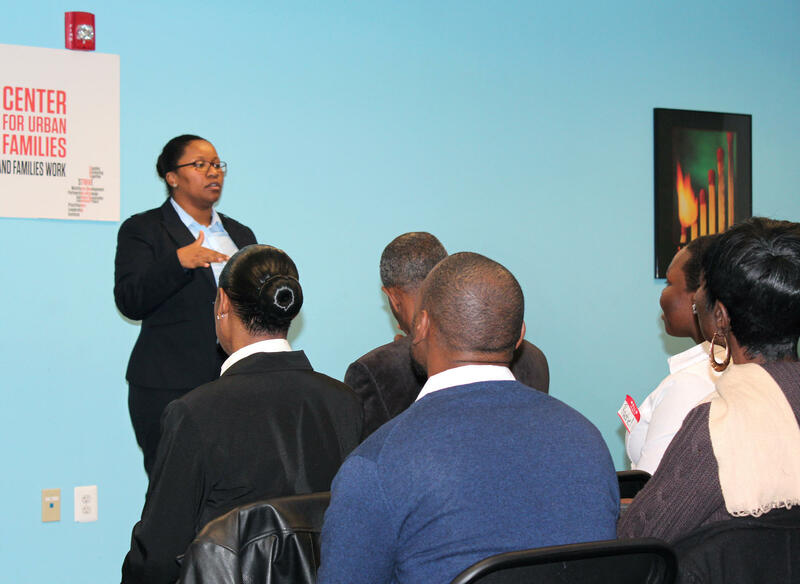 An orientation at the Center for Urban Families. In a West Baltimore classroom, three dozen adults — all African-American, mostly men — are in their first week of "pre-employment training." "Show me Monday, what does Monday look like," asks the instructor. They all raise one hand high above their head. "That's where the energy should be every day," she says. "Stay alert!" The class responds in unison: "Stay alive." The Center for Urban Families offers this course in a blush brick building across the street from where Freddie Gray's funeral was held. It aims to address one of the problems made urgent by Gray's death: a staggering unemployment rate in this city's poorest neighborhoods, especially among young, black men. "It's really a training ground, if you will, for individuals to get some very much needed attitudinal skills and life skills," says Tenille Patterson, the center's chief operating officer. She says too many in Baltimore grow up without seeing anyone hold a steady job. "Our class is nine-to-five, Monday through Friday for four weeks, so that people can make the life skills adjustments of child care, of getting up every single day on time," she says. One of the youngest in this session is 21-year-old Isaac Cobb Jr., who sports a new, short haircut and a navy suit with striped tie. Cobb says his entire extended family is involved in gangs, and he started selling drugs at age 10. "It's almost like the Jewish, when they turn 13, they're supposed to become a man," he says, referring to a bar mitzvah. "It's like a way of life." Cobb says he never liked that life. In this class, he says he's come to understand how he learned to act tough in order to survive. "So you have to put on this fake mask almost, to try to hide who you really are, inside," he says. "And it starts to change you." Cobb has gone on a string of job interviews, trying to replace the drug money he recently gave up. But he wonders if his tough act has cost him. "I realize when you're going into interviews, they have people around that's just watch you," he says. "And I guess the way I would look around, and I have this mug on my face, and it would intimidate the employer." Others come to class with a work history, but have trouble keeping a job. "I'm more like an emotional wreck because I been through abuse," says Chrissy Smith. At 35, she has spent 12 years, off and on, as a lab tech. But she says she struggles to keep her focus on work. "My mother was on drugs, but she's been a recovering addict for like 21 years," she says. "And my father was nonexistent." There was a series of foster families. A relationship turned violent. And a baby daughter died of sudden infant death syndrome. Smith exudes confidence, with an easy manner, a smart black suit and her hair wrapped up high. But the more she talks about her life, it's clear she can't shake her inner turmoil. "I walked around all these years lost," she says, voice trembling. "And being here is teaching me that I can not do that anymore. I have to rise above that." 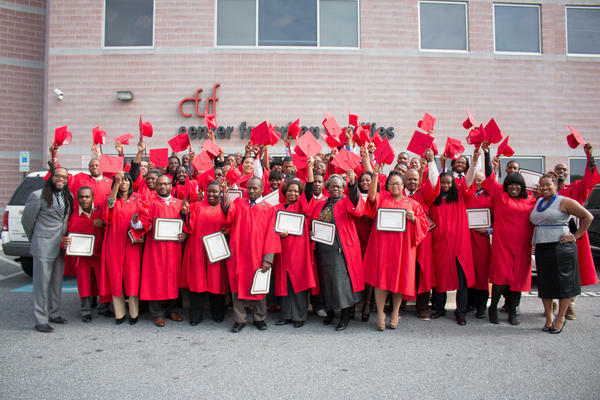 The Center for Urban Families says 300 people complete this employment training program each year. More than 200 are placed in jobs, including with major employers like Johns Hopkins University. The average wage for a graduate is $13 an hour. "However, many of those we place two and three and four times," says Patterson. "When you have someone that hasn't been consistently employed for two or three years, that first employment opportunity often doesn't stick." The poverty and violence laid bare by Freddie Gray's death is a longstanding problem. And addressing it, a long-term project. In Baltimore, the death of Freddie Gray, the riots that followed - they've sparked a new sense of urgency over the city's poorest neighborhoods. One priority - a staggering unemployment rate, especially for young black men. NPR's Jennifer Ludden reports on the challenges many face in finding and keeping a job. JENNIFER LUDDEN, BYLINE: Freddie Gray's funeral was across the street from the Center for Urban Families. TENILLE PATTERSON: Show me Monday. What does money look like? LUDDEN: In this West Baltimore classroom, three dozen people are enrolled in what's called a pre-employment training class. They're all African-American, mostly men, dressed sharp in suits and ties. They raise one hand high above their heads. PATTERSON: That's where the energy should be every day. Stay alert. PATTERSON: It's really a training ground, if you will, for individuals to get some very much-needed attitudinal skills and life skills. LUDDEN: Tenille Patterson is the Center's chief operating officer. She says too many in Baltimore grow up without seeing anyone hold a steady job. PATTERSON: Our class is 9 to 5, Monday through Friday, for four weeks so that people can make the life skills adjustments of childcare, of getting up every single day on time. ISAAC COBB JR.: My name is Isaac Cobb Jr., and I'm 21 years of age. LUDDEN: Cobb says he started selling drugs at age 10. His entire extended family, he says, is involved in gangs. In this class, he says he's realized he learned to act tough to survive. COBB: So you have to put on this fake mask almost to try to hide who you really are inside. And it starts to change you. LUDDEN: Cobb has gone on a string of job interviews trying to replace the drug money he gave up. But he wonders if his tough act has cost him. COBB: I realize, when you go into interviews, they have people around that's just watching you. And I guess the way I would look around, and I have this mug on my face, and it would intimidate the employer. LUDDEN: Others come to class with a work history but have trouble keeping a job. CHRISSY SMITH: I'm more like a emotional wreck because I've been through abuse. LUDDEN: Chrissy Smith is 35. She spent 12 years here and there as a lab tech, but says she struggles to keep her focus on work. SMITH: My mother was on drugs, but she been a recovering addict for, like, 21 years. And my father was nonexistent. LUDDEN: There was as a series of foster families, a relationship turned violent, a baby daughter who died of sudden infant death syndrome. When we first meet, Smith exudes confidence - black suit, hair wrapped up high. But as she talks about her life, it's clear she can't shake her inner turmoil. SMITH: I walked around all these years, lost. And being here is teaching me that I cannot do that anymore. I have to rise above that. UNIDENTIFIED GROUP: Excuses are tools of incompetence. LUDDEN: Excuses, the class chants, are tools of incompetence. Three-hundred people complete this program each year. The Center for Urban Families says just over 200 are placed in jobs, including with major employers like Johns Hopkins University. The average wage for grads - $13 an hour. PATTERSON: However, many of those, we place two and three and four times. LUDDEN: The Center's Tenille Patterson. PATTERSON: When you have someone that hasn't been consistently employed for two or three years, that first employment opportunity often doesn't stick. LUDDEN: The poverty and violence laid bare by Freddie Gray's death, she says, is a long-standing problem, and addressing it, a long-term project. Jennifer Ludden, NPR News. Transcript provided by NPR, Copyright NPR.